Extended front ends were necessary to contain what developed into the Master Mechanic's Front End arrangement, which did a really much better job of controlling sparks and cinders (as well as preventing tubes from getting plugged) than the earlier design. With this arrangement, most coal burners went to shotgun or straight stacks, and wood burners kept stack mounted cinder control systems since wood provided a lot more and lighter flaming combustion products along with the draft.....relatively speaking. Foundrymen won't need to wonder about the addition of the cast thick ring at the top of the stack - it works like a riser as the metal cools and prevents warpage as well. If you want to understand these things, you must consider them as integral parts of the organic whole rather than as seperate bits in their own universes. It isn't like choosing different rims for your cars wheels - it all functions as a rational system. "Ornamentation" had some unusual connotations in the modern steam era. For some roads, it was an alien concept. Others took it to mean a pleasing design overall, though such an effect often seems to have been accidental rather than purposeful. Sometimes the effect came from paint on a good basic design, as in the case of Southern's famous Ps-4 4-6-2s, or the passenger striping so beautifully displayed by Frisco 1522. (Good maintenance helped a great deal in both cases.) I always thought a bit of white or silver trim, as used by C&O, NKP, and Canadian National could look really good, but there are also cases where this would not quite look right--somehow white tires just wouldn't visually fit under a Norfolk & Western J or an SP Daylight, both of which were streamlined 4-8-4s with some bright coloring, particularly the Daylight. In the case of the NC&St.L., I think those capped stacks were a whim of the road's president, who was otherwise a fellow to pinch pennies. I think some of those engines were even refitted with capped stacks on that road--in fact, that particular locomotive looks an awful lot like a Russian Decapod. Did the Dixie line have such engines? Some roads in the 1920s took a liking to the clean look typical of British power. Chicago Great Western, Reading, and Baltimore & Ohio each had a 4-6-2 each styled this way; Delaware & Hudson was perhaps the greatest proponent of this style, with a fair number of engines incorporating this smooth British look. B&O 5320, photo from Northeast Railfan, showing the engine with its poppet valve motion and low British style running boards, but now with a conventional smokebox front--this engine originally had a British style front with a door that closed with a dart going into a hole in a central bar inside the smokebox, and closed with locking handles. Richard Leonard's gallery gives us this shot of B&O No. 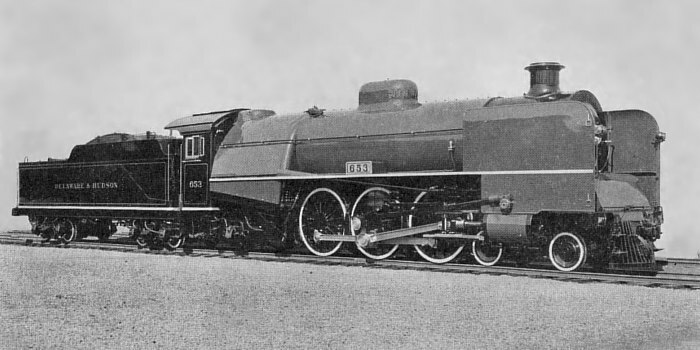 1, the high-stepping experimental Lady Baltimore, showing a combination of a long pilot with rotating coupler, Emmerson water-tube firebox, general clean lines, that British smokebox door, and a capped stack. Not visible is an overall coat of blue paint. All these are examples of passenger engines, but you had some on freight power, too. 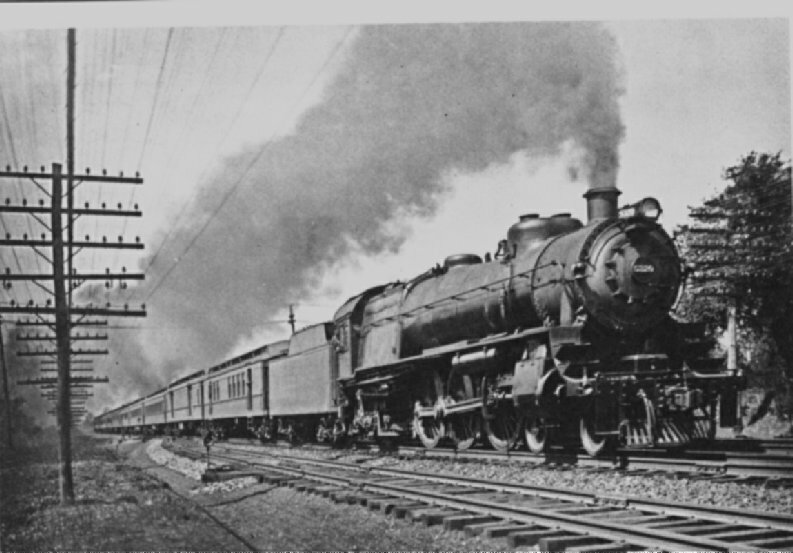 Southern showed this with black freight engines that had all sorts of touches applied by their crews, a practice that was possible due to SR utilizing the practice of assigned engines much later than most other roads, which had gone into common locomotive pools. Occasionally this was also official, in the form of flanged stacks, painted trim, and an overall paint finish. Take another look at T&P 666, and note the difference in shades between the tender, cab, and domes, with the shade of the boiler and cylinder jackets. The tender, cab, and domes are black--but the jacket is a dark green, in a partial simulation of one variation of Russian iron! 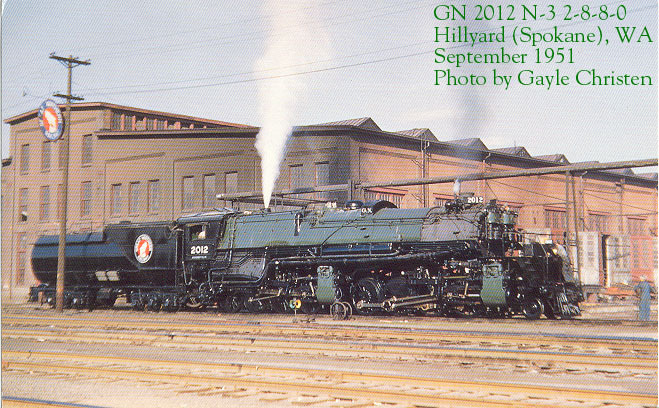 I suspect this locomotive's colors and their effect might have looked something like these examples from the Great Northern. 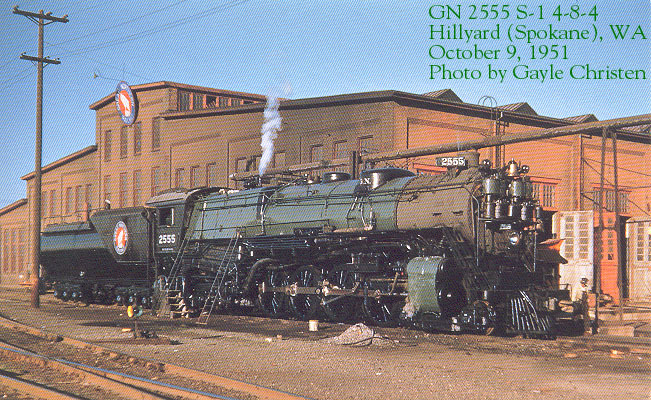 A sister of that Big G 4-8-4 survives today--that would be one engine to get to run again! BNSF, would you be so kind to consider? Yes I agree that railroads added a lot of little flourishes and touches to the appearance of later locomotives. And some made large gestures regarding the subject of hiding the piping for a clean look overall. Maybe the flange stack was just part of that quest for good looks. I can’t think of any functional reason for a flange on an all-cast iron stack. I notice that the flange on the stack of #666 and ones on the later NC&StL engines seem a bit more shapely that some of the ones on the D&H and B&O engines. I have always been intrigued by #666 as it appears in that Shorpy photo. To me, there is something unusually intriguing about the look, which seems more expressive than usually is the case with a large locomotive having so much complexity compacted on its exterior. It almost reminds me of a narrow gage locomotive. And I think that big flange stack is contributing a lot to that sort of look. But I still think it a bit curious that the flange stack came forward in history while similar ornamentation such as the “cookie jar” steam and sand domes, which abruptly ended before 1900, and were never revisited. Yet one could argue that those domes made an aesthetic statement very similar to the flange stack. It seems like I have seen that flange stack detail in early industrial settings such as with stationary boilers, perhaps in England. Weren’t a variation of flange stacks also used on riverboats? Though, I'm more of a Southern guy, the NC&StL is right up there with me. Capped stacks on the NC like the T&P were a general road wide preference for aesthetics, each railroad (and depending on the railroad, like Southern for example, each shop) had it's own styling characteristics. It's very prevalent in the South where many a road and its engineers were proud of its locomotives. The L&N had its headlight lens numbers, the NC its caps, and Southern just about anything that could be tweaked (including in some instances both of the previous queues from engineers who swapped railroads). The NC did have some Russian decapods, some of which, according to one of R. Prince's "bibles," were secondhand from the Southern. I'll have to take a closer look at 666 (and other similar engines) to try and see why this locomotive has the effects you say it has; usually there is some reason in proportion or perhaps photo angle that gives it this look you say you see, although this can also be quite subjective! It's an informal look at locomotives and locomotive finishes as architecture; it's been a while since I've looked at my own copy (which is downstairs just now), but author H. Stanford Bryant seemed to think certain finishing practices (i.e., Southern's passenger green and gold striping) came out of a classical architectural revival ca. 1910. He also makes the point that much of this was regional in nature, being most prominent in the southeastern US. He may have been on to something. . .
Of tangental interest--Bryant, writing this in 1961 or 1962, thought it was strange that Hollywood would somehow have missed out on making a really good movie about railroading, one that was accurate, colorful, and dramatic--not the usual western horse opera, but one set in modern times (i.e., the 1930s). He thought Hollywood was missing out on this--as do I, having attempted to put together a TV series along these lines some 20 years ago, but being unable to sell the thing. Sadly, some things just never change. . .
Whoa. Some remarkable old photos. Thanks for the photo links and information. 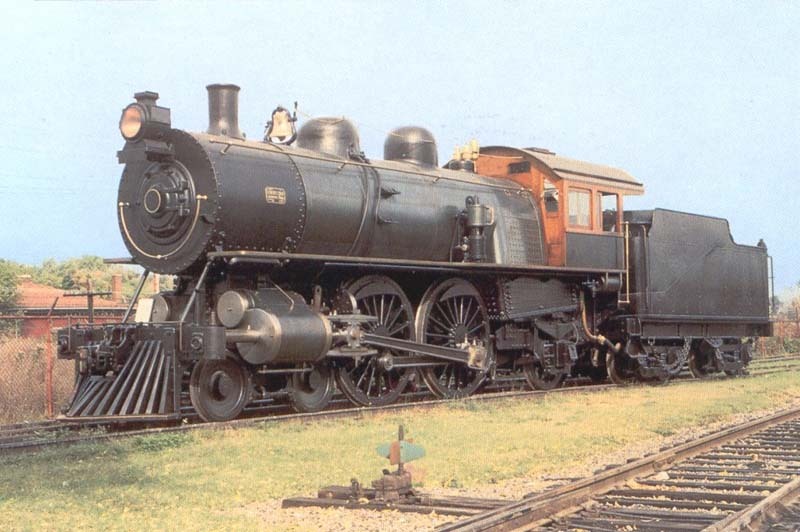 My favorite locomotive aesthetics are from around 1880 to 1900, and probably the most favorite is right around 1900. I really like the originally built #999 that we were recently discussing here in regard to tender trucks. Here is another one that I think is astoundingly good looking. There were others similar on the CB&Q, and Burlington & Missouri River RR, including some compound versions. These were very fast locomotives. They are detailed in BURLINGTON BULLETIN No. 44, where it says that these locomotives were said to go just as fast as any man wants to run them. And engineers were reminded that it was not necessary to make up all the lost time before they reached the first station out of the terminal. I happen to be a big Superpower fan, but like anything with a firebox at one end and a stack at the other. . . The evolution of steam locomotives is always an interesting subject, and that includes the aesthetics or "architecture" of the machine. From the bright, colorful, fanciful period of steam's youth to the utilitarian but still handsome look of later engines was a fascinating procession, and this step is as interesting as the others. Paraphrasing the late David P. Morgan on just this subject, the locomotive in this time grew both larger and less complex. Gone were the brass trim and bright colors, yet to come were the outside valve gears and auxiliary devices of modern power. What we had in this time was what I would describe as a refined simplicity, although the technology was approaching limits that could not have been exceeded without those auxiliary devices, most notably superheating and mechanical stokers. Still, we have elements from the past here in the paint and finish. Painted parts are now likely utilitarian black--but that boiler jacket looks to be unpainted Russian iron, and there is striping aplenty, including stripes on the driver spokes and pilot slats, both present on Mr. Markoff's "Eureka" from 1875. Tender trucks have some striping, too. And those boiler bands are interesting, too--apparently not flat, but with embossed edges, and curiously, the edges stand out as a bright metal of some sort, perhaps brass. I wonder if the bands are brass, with the flat center section painted, and the embossed edges left in natural metal. The rods are definitely finished that way--wonder what the color there was? I wonder if John White reads this and can offer an answer? It's not likely we'll ever see this one run--but wouldn't you like to see that anyway? The D&RG's early locomotives burned coal but still used the familiar Baldwin diamond stack. G. Brewer had a comment about the late Carl Fallberg's "Fiddletown & Copperopolis" comic series that ran in Railroad Magazine many years ago. For those not familiar with Fallberg, he was an artist and cartoonist for Walt Disney in the prewar years, and later did other work as well. As with several others of the early Disney crew and like Disney himself, he was a rail enthusiast, with a liking for the colorful, romantic era of the narrow gauge lines in the West of the 19th century. For a number of years he wrote and illustrated a monthly single-panel strip for Railroad Magazine, which was later compiled in book form. I have lambasted Hollywood and amusement park rides and some tourist roads over the years for making up caricatures of 19th century railroading that just don't come out right. Fallberg's work was different, even if a spoof. Oh, why, why didn't Disney do a series on the little F&C? I am somewhat surprised that Dubs & Co. built that locomotive to a pattern that is seemingly identical to the American practice of Baldwin, Hinckley, Manchester, Rogers, and other American builders of that era. I guess that because that pattern was so strongly established during that period, customers expected new locomotives to follow it, no matter who built them. More likely that the Canadian purchaser sent some pretty specific requirements to Scotland for their order. Canadian railways were more like US than UK in pattern, and with good reason - both the US and Canada built railways to populate frontiers and create a country from a lot of wide spread real estate, whike UK railways pretty much replaced roads and canals through already densely populated areas of smaller geography. Interestingly, British railway builders in Australia and in other countries did revert to UK practice such as plate frames in many instances. i suppose it was bacause there was no neighboring country with developed, mature railway manufacturing capabilities. Fake diamond stacks are indeed considered to be objectionable by many, especially when applied to a modern, piston valve locomotive in an attempt to back-date the appearance for some historical cause. However, the Burlington & Missouri River class D-4 2-8-0s built in 1903 were equipped with diamond stacks to cope with the fact that they were lignite burners. Maybe somebody can find a link to a photo, but I could not. In any case, here we have burly 100-ton consolidations with, piston valves, extended piston rods, 79½” diameter boilers-- and diamond stacks.